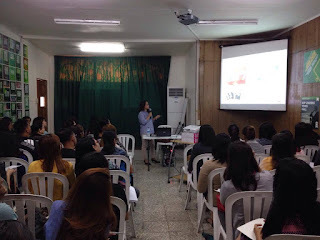 Teacher Barbara (Bambi) Munar, a speech and language pathologist (SLP) began her seminar by explaining the role of the Speech-Language Pathologist not only in addressing speech and language impairments but also in addressing social and cognitive communication and even swallowing disorders. She stated that communication was fundamental in all aspects of life and was a foundation for learning. Impairments in Social Communication is one of the salient characteristics of autism and it is estimated that about 25% of persons on the spectrum are non-verbal. Others may have speech but are difficult to understand and/or have difficulty understanding others. Communication includes non-verbal modalities, such as gestures, body language, facial expressions, pictures, printed word. Augmentative & Alternative Communication (AAC) is the means by which PWAs can express themselves through all communication modalities. AAC is also an integrated system of symbols, communication aids, strategies and techniques that should be used by everyone (especially the intervention team) interacting with the child and in all his environments. Since the child spends time in school and the teacher is a frequent communication partner, the teacher can assist in communication assessment, intervention, advocacy and training. The child’s IEP should integrate communication goals and strategies set by the intervention team. One of the steps in formulating communication goals and strategies is to conduct an physical environment inventory and communication inventory. Look at the child’s schedule and routine, identify what the communication opportunities are in these tasks, what are the demands of these tasks and how the student’s communication and participation can be supported. Identify the core vocabulary i.e. words used with high frequency composing 75-80% of communication (e.g. help, more, all done/finished, that, want, stop, etc.) and the fringe vocabulary (i.e. words used only in specific contexts). Communication is multi-modal. One should respond to or acknowledge all attempts at communication. Facilitate multi-modal communication by providing communication boards, modeling/teaching natural gestures depending on the ability and preference of the child. Teacher Bambi showed examples of no-tech to high tech devices and gave general principles of how to create displays/communication boards. Vocabulary words should be organized in such a way that the child can easily recall and retrieve the word he wants to use. What modality (objects, photographs, pictures, gestures, words) to use and how to teach the child to use it depends on the ability of the child to associate these symbols with their meaning. She also showed different strategies and techniques of teaching the child how to communicate e.g. Aided Language Stimulation by showing videos. Teachers need to be conscious about fading prompts to effect spontaneous and appropriate communication. She dispelled myths about AAC and answered some issues and concerns about devices (which device/app to use; when to introduce AAC; etc.). In summary, she stressed that it is important to know the child and presume the child’s competence; be willing to learn the child’s AAC system; and to work as a team, collaborate and communicate among team members. There were 69 participants including occupational therapists, parents and teachers in the seminar held at Autism Society Philippines National Headquarters last 28 August 2016.